There are a variety of forces that affect mountain bikes. The main force in particular is the force of gravity. Bikes are equipped with gears to compensate for the force required to overcome gravity (uphill) and brakes when gravity is working in our favor (downhill). An object at rest will stay at rest or an object at a constant velocity will stay at a constant velocity unless enacted upon an unbalanced force. This law applies to the steep slopes of the hills and the various terrains that mountain biking consists of which requires a design that can compensate for these factors. For example, a mountain biker is at the top of the hill, just on the start of the decline. If the coefficient of friction is not large enough, then the bike will begin to move on its own with no force applied. The bike that was originally at rest is now in motion due to an external force, gravity. Now that the bike is in motion, it will continue to move unless another force in the opposite direction becomes active. The part of a mountain bike that is in charge of controlling the speed are the brakes; an essential part of the bike which can prevent injury from loss of control due to excessive speed. When the brakes are applied, the force of friction increases due to the increase in rolling coefficient of friction. This unbalanced force is what brings the bike to rest demonstrating Newton's first law. An object's net force is equal to its mass times acceleration. As you can see from the equation, net force is proportional to its mass. If you double the mass, then the net force doubles as well. Additionally, net force is proportional to the acceleration. If you subtract half of the acceleration, then the net force will be half of the original. Proper use of brakes are essential in mountain biking to decrease the chances and severity of an injury. Descending down a hill at a high speed does involve some safety precautions; good visibility of track, not near any obstacles, and a working set of brakes. Without brakes, makes the process of slowing down more challenging from a rapid acceleration. Failing to do so equals a larger net force which means an accidental collision with an object such as a tree is going result in a more serious injury. For ever force, there is an equal and opposite reaction force. In mountain biking, the only part of the bike making contact with the ground are the front and rear tire. 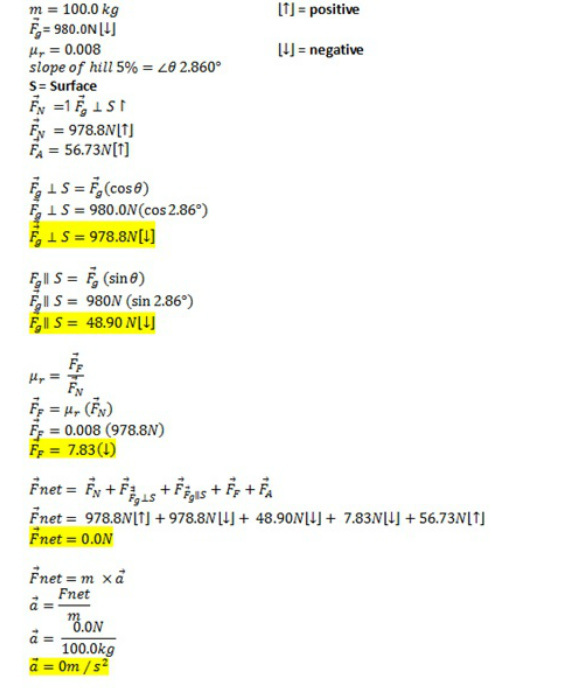 By applying a rotational force about the pedals produces a reaction force of the rear wheel spinning because of the connected drive train. Since the rear wheel is spinning due to the applied force is applying a force to the ground, there is an equal reaction force of ground applying a force to the wheel. This ultimately explains how mountains are able to move; accelerate, decelerate, and stop. Additionally, the suspension of mountain bikes uses the principal of Newton' third law. Riding over rough terrain of several bumps and depressions, suspension systems on mountain bike transform the reaction force more into the bike itself instead of into the rider. To put this into perspective, suspension absorbs some of the sudden jolts can reduce the stress on the rider and the bike. For example, as a rider hits an unexpected hole in the ground, the front wheel suddenly drops. As it drops and begins to make contact with the lowest part of the hole, there is a force being applied towards the ground. This produces a reaction force of the ground applying a sudden force to the wheel. The job of the suspension is to absorb some of the force from that sudden change. Riding over a bump such a rock or roots of a tree require suspension to reduce the shock as displayed in the picture below. Biking up a hill over rugged terrain is strenuous on the body because of the change in forces due to the angle of the surface. As you increase the slope being traveled up, this significantly decreases the normal force which produces more of a pulling force. The force due to gravity can be separated into its components; parallel to the surface and perpendicular to the surface. As the incline increases, the components change drastically which produces a force pull the object down (force due to gravity, parallel to the surface). This is why if feels harder to pedal up an incline because there is an additional force that has to be overcome in order to progress. The surface of the terrain is rough but paved road; the coefficient of friction is 0.008 (10). Since there is zero net force on the rider, there is no acceleration. The velocity going up the incline is constant. 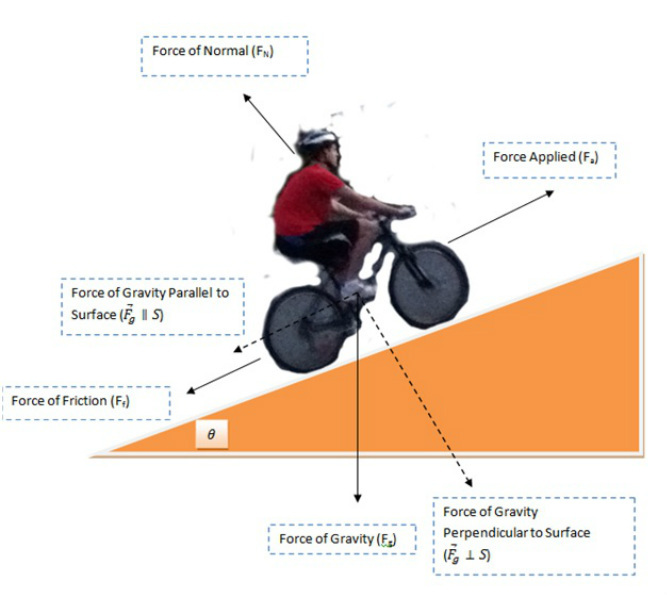 As you can see of the free body diagram of the biker going down hill, the magnitude of each force remains the same (angle of slope is the same) compared to the up hill free body diagram. The only difference is that there is only one force slowing the rider down which is force of friction. The force of gravity parallel to the surface is now in the same direction that the rider is moving. Since the the force is in this direction, the rider is able to use this force to accelerate instead of have to apply a greater force compared to going up an incline.